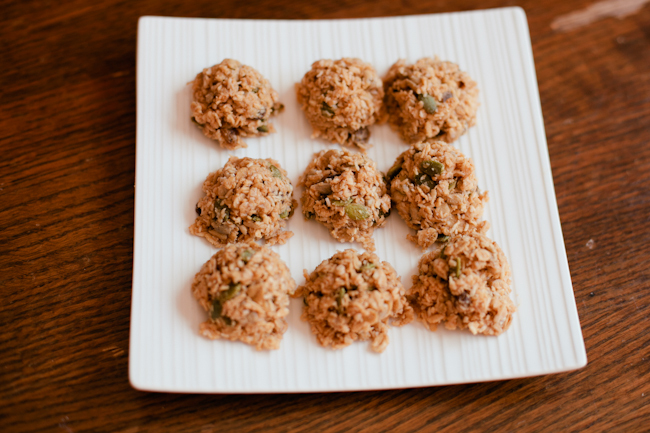 No Bake Energy Bites | .liveit.loveit.blogit. It’s Monday friends! Are you going to do big things this week? My to-do list is daunting, but I’m excited about getting back down to business this week! And how better to get lots of things done than fuel. And by fuel, I mean food. A thing that I used to do when I had an office job was mid-afternoon snacks… Usually I brought along something healthy—fruit & yogurt, crudites, homemade trail mix, for example—and other times I’d run down for a mid-afternoon kefir (and if I’m being totally honest here, sometimes a bag of chips), but I almost always had something to help quell my hunger between lunch and dinner. You would think that such mid-afternoon snacks would have become easier after my transition to working from home, but in fact no. Without the routine (or the ease of food-court access) that comes from the office my mid-afternoon snacking fell by the wayside when I left my job. 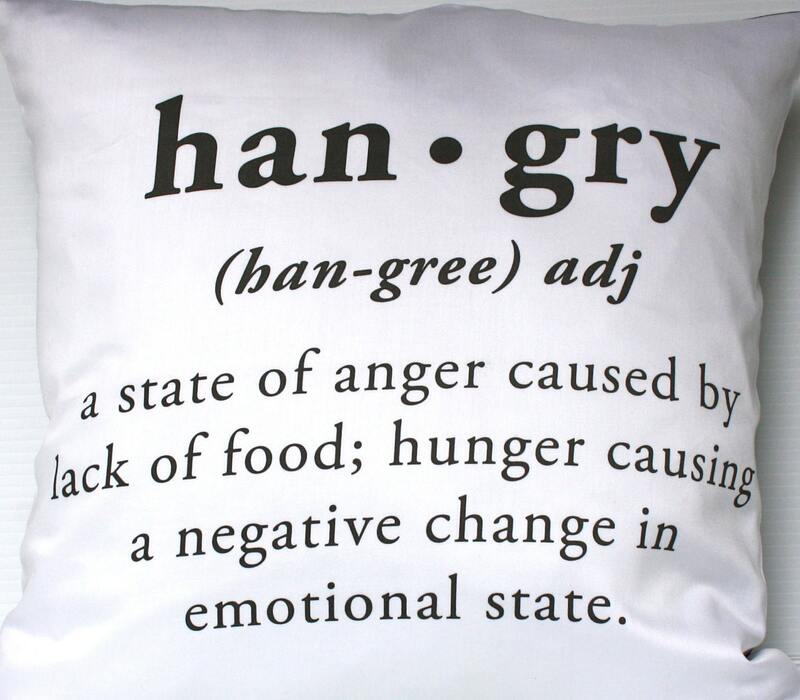 If your not familiar with the word “hangry”, familiarize yourself now. If it isn’t obvious to you, hangry is a mashup between hungry and angry, and it is what happens to me—and to most people I know—when we get hungry. For me, 4pm is hanger time, and it isn’t pleasant for anyone in it’s path. I needed to find an at-home snack. Inspired by pinterest, I decided to try out these “no-bake energy bites” and am I ever glad that I did. The original recipe makes it clear: any recipe for these bites is just a suggestion, and I took it as such myself. With the basic building blocks (oats, coconut, and peanut butter) you’ve got the perfect platform for all sorts of varied mid-afternoon snacks. This time, I used oats, coconut, peanut butter, raisins, flax seeds, and pepitas. I didn’t add another sweetener (e.g., honey in the original recipe), and I actually think that made it easier to eat just one or two. 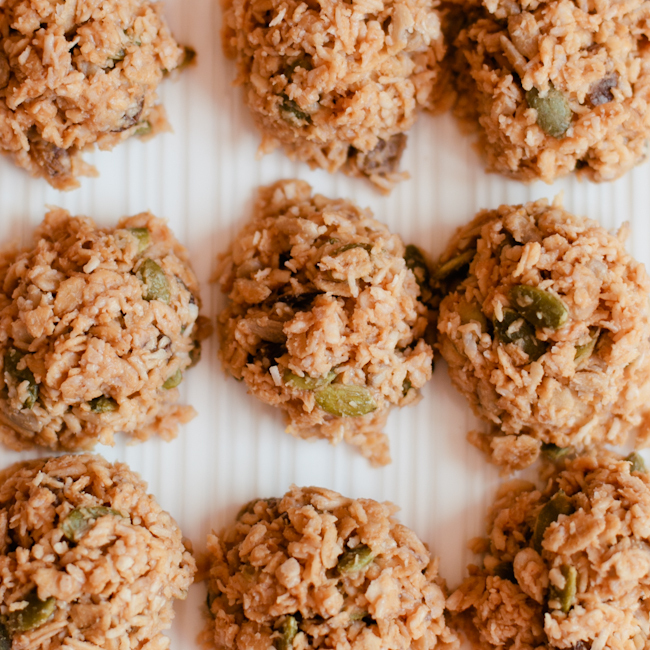 You could even take these delicious bites to the office, as long as you don’t have a no-peanut policy in effect (or alternatively, if you use a different nut-butter). 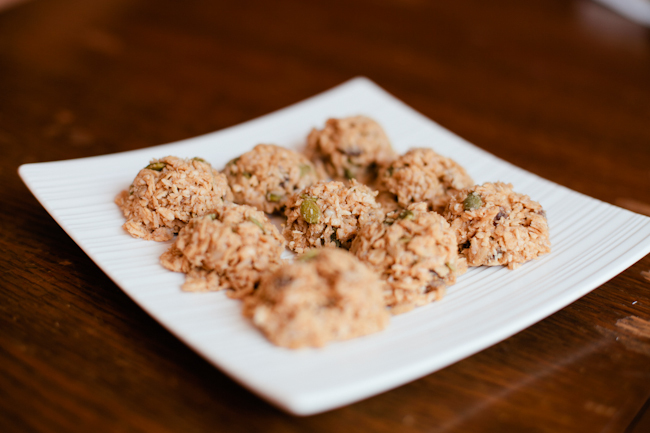 Relatively nutritious, delicious, filling, and quick to make make these extra awesome. Love at first bite, to be sure. Thoroughly mix everything above in a medium bowl. Let chill in the refrigerator for about a half an hour. Once chilled, roll into balls (or use a spoon and scoop into half balls) and enjoy! Store in an airtight container and keep refrigerated for up to 1 week.